Explore CME opportunities from CCMS and our partners. Complimentary CME listings are available for CME events that are free to physicians, or to local, Collier County providers who may be asking for a nominal registration fee. To add your event to our web listing, or to inquire about paid advertising opportunities, email us or call 239-435-7727. New Florida Required Opioid CME online courses (for Florida licensed physicians with a DEA license): Baptist Health (free to all physicians); Florida Medical Association ($25 for FMA members, $75 for non-members); Florida Osteopathic Medical Association (free for FOMA members – call FOMA for discount code, $75 for non-members); Florida Academy of Family Physicians (free for FAFP/AAFP members, $80 for non-members). Though not part of the Florida opioid course requirement, additional CMEs on opioid prescribing are available free online from the CDC’s Guideline for Prescribing Opioids. The Florida Medical Association and American Medical Association , and the AMA’s “Steps Forward” program, offer a variety of online CME and enduring CME courses available at no charge or for a nominal fee. The American Cancer Society provides free CME for physicians and other health care professionals on all aspects of oncology, from cancer prevention and diagnosis to treatment and palliative care. Visit www.CME.AmCancerSoc.org to participate. The Doctors Company provides free online CME and educational webinars focused on patient safety, including prevention of medical errors for Florida practices. Visit their website to learn more. The Bureau of Vital Statistics offers a one-hour Physicians’ Online Tutorial on Completing Cause of Death on the Florida Death Record for AMA PRA Category 1 Credit. Free courses from CMS.gov. Includes self-paced courses on the Quality Payment Program, pre-recorded grand rounds on quality, national provider calls, and web-based CME from Medscape. AMA PRA Category 1 Credit amounts vary. OptumHealth Education provides a variety of free, web-based CME/CE activities for physicians, nurses, and pharmacists. To search for additional online courses, utilize the CE Broker Course Search. 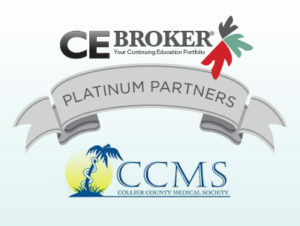 CCMS is pleased to offer a professional CE Broker account to all members for free as a member benefit. The Florida license renewal system requires physicians to track their CME credits in the Department of Health (DOH) online continuing education tracking system called CE Broker. DOH will verify each renewing physician’s continuing education credits in CE Broker at the time of renewal (starting with the January 2014 renewal). Physicians will be prompted to report additional CME credits if their continuing education records are incomplete (i.e., less than the hours required of that particular licensee for that particular licensure term). CME providers in Florida have the option to report attendance data for their activities, but are not required to do so. CCMS will register each participating physician member with a professional account. Normally this would cost $29 a year but there is no charge to CCMS members. To register: contact the CCMS office with your name and license number: call 239-435-7727 or email us. As soon as we register your details, you will receive information directly from CE broker to get started. Don’t delay; start reporting your CME credits NOW.